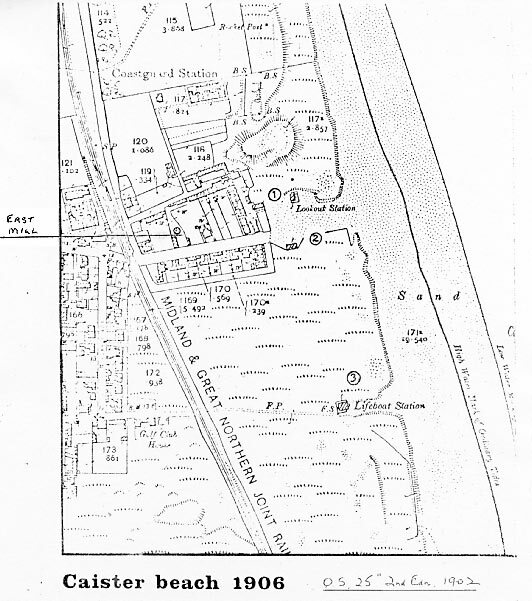 Caister East tower mill was 42 foot high red brick mill that stood adjacent to Beach Road. In 1835 the mill was using two pairs of French Stones and a flour powered by sails on a cast iron windshaft. In 1842, common sails had recently been replaced by patent sails. Also on the site at that time were a dwelling house, suitable storage, garden and a newly erected bakehouse. For particulars & conditions of sale apply to Mr. Cuddon, Conveyancer or the Auctioneer, Theatre Street, Norwich. A Brick Tower Windmill driving two pair of Stones, with Flour Mill & Cast Iron Shaft, erected in the most substantial manner about 17 years since, with a large Yard, Garden & Carpenter’s Shop. All the above Lots are situate in Caistor next Yarmouth, are all freehold & except the Cottages, are in the tenure of Mr. William Davey. To be Let or Sold With Possession at Michaelmas. An excellent Brick Tower Windmill in full work, driving two pairs of French Stones & having recently had Patent Sails affixed. Also a Cottage & Garden near with a Stable, Barn & about 2 acres of Land, now occupied by Mr. Beck. Freehold. The tenant will show the premises. Apply to Messrs. Cuddon, Conveyancers, St. Giles Plain, Norwich or Mr. Isaac Davey, Caister. To be let with immediate possession. A Capital TOWER WINDMILL driving two pairs of stones, with patent sails, also Dwelling House, Stables & Granary, all in excellent repair situated at Caister, within two miles of Yarmouth, in which an extensive wholesale & retail trade has for many years being carried on. Apply to Richard Ferrier, White Horse Plain, North Entrance, Great Yarmouth. WITH IMMEDIATE POSSESSION, a TOWER WINDMILL with patent sails, two pairs of Stones & all going gears complete, with house & other buildings, situated at Caister near Great Yarmouth. Inquire of Mr. John Wincott, Prospect Place, North End, Great Yarmouth. A Brick Tower Corn Mill with patent sails, self-winding, suitable storage, Dwelling house, Gardens, newly erected Bake office … situate in Caister about two miles only from … Great Yarmouth. For Rent & Particulars apply to John Clowes, Solr. Regent Street, Great Yarmouth. Capital Brick Tower Windmill, dwelling house, Bake office, gardens etc. All Freehold with early possession. Clowes & Flowerdew are favoured with instructions from the Mortgagees under trust for Sale to Sell by Auction at the White Horse Inn, Great Yarmouth on Wednesday 3 September 1862 the above excellent PROPERTY. Apply to Mr. Clowes, Solr. Great Yarmouth or at the Auctioneers’ offices Bank Chambers, Norwich. All that capital Brick Tower Wind Mill exceedingly well situated near the beach in the best part of the Village of Caister. Mill has two pairs of Stones, Patent Sails, is fitted with Flour Mill, Jumper & all other requisite machinery. Also adjoining a newly built Bake office, Stables, Warehouse, Cart shed, Pig sties & other requisite sheds & buildings. Also a comfortable Dwelling House etc. the whole standing in the Mill Yard, walled-in garden of nearly half an acre. Apply to John Clowes, Solr. Great Yarmouth. A good opening for doing a thriving trade at Caister next Great Yarmouth. A capital Freehold brick tower windmill, convenient Dwelling house etc. If not forthwith sold, same will be let at & from Michaelmas next. To be Let at Michaelmas next. A Brick Tower self-winding CORN MILL with vane sails, working two pairs of Stones, Miller’s house, Baking office, Warehouse, Stable, Hay house, Cart shed, Piggeries, Gardens & other conveniences. The above can be hired with or without a Farm house & Premises next the Mill with 14 acres of Land. Rent of Mill & Baking office £45. Farm £42. with guarantee required for rent. Above can be hired with or without Farmhouse & premises next mill with 14 acres of land. Rent of Mill & bake office £45, Farm £42 with guarantee required for rent. Caister Mill with cottage, stowage & bake office attached, situate within three miles of Great Yarmouth. Particulars of Mr. Clowes, Solr. Great Yarmouth. Particulars at the Auctioneers’ Offices, Bank Chambers, Norwich or of the Vendor’s Solicitors, Messrs. Clowes & Chamberlin, 13 Queen Street, Great Yarmouth. Sale of Windmill & surrounding buildings comprising Hay-house, Stable, Granary, Cart shed, Carpenter’s shop, Hen house, Bake office & Dwelling house. The Mill is 42 ft. high, in good working order fitted with usual machinery & two pairs of stones for barley & wheat, flour hopper, same for wheat etc. House has four rooms & wash-house detached with pump of good spring water. Mill & premises stand in about a quarter of an acre of ground, is walled with exception of east side which is fenced. Above will be sold with immediate possession & goodwill; tenant retiring from business will introduce to present customers & part of purchase money may remain on mortgage. For rent etc. apply to Horatio Fenner, Auctioneer etc. 12 Regent Street, Great Yarmouth. 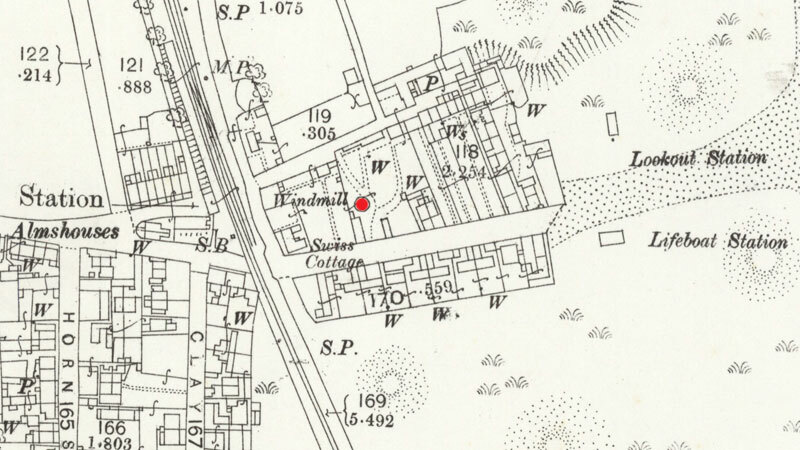 Image produced from the www.old-maps.co.uk service with permission of Landmark Information Group Ltd. In 1970, the mill foundations lay partly below the garden of No. 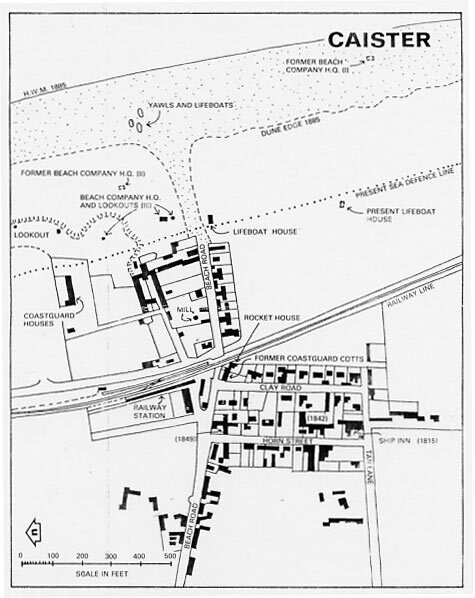 115, Beach Road and part of the yard of No. 1, Old Mill Road. Amelia Stannard (25) not born Nfk. Alfred Pells (15) apprentice miller.